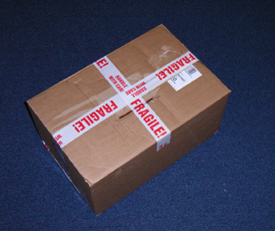 It is surprising how many instruments we take delivery of, via carrier, that are inadequately packed. Most are lucky and somehow arrive undamaged, however, we do recieve several instruments per year that are damaged due to poor packing. 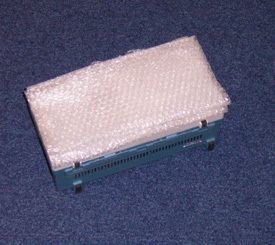 Please see our 'Badly Packed Instrument Gallery' for some examples of these. 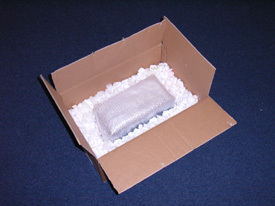 Insurance companies will not pay out for damage due to poor packing and while we would hope that the courier treats each individual box with kid gloves, that is not always the case - kid gloves could turn to goal-keeping gloves as 'box football' is played at the courier company's depot. OK, we made that last bit up, but as you do not know how your instruments are going to be handled it is up to you to ensure that you have done all in your power to ensure that damage, if occured, is not down to you; thus helping you sleep at night. 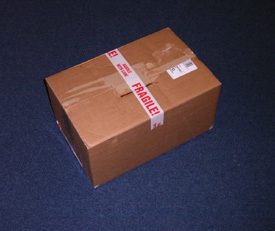 The following is our guide to packing instruments safely. 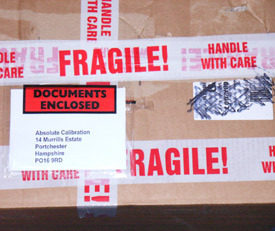 Please remember that even when packed correctly, damage can occur - from courier neglect to vibration damage (such as boards coming loose), therefore, Absolute Calibration will not take responsibility for any damage to instruments sent by carrier that you have packed. 'Poly-chips' (these now come in shades of pink and green; which is nice. White is acceptable). Use cellotape or masking tape - they are not strong enough. Use shredded paper. Shredded paper is to keep hamsters warm at night; not to protect instruments. 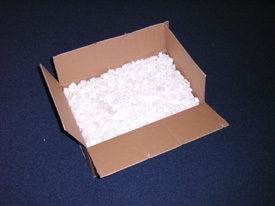 Use at least a double-ply box, allowing at least 50 mm (2") clearance between the edge of the box and the instrument. 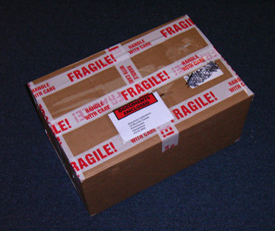 Used boxes are fine as long as they are not damaged, BUT remember to re-tape the base of the box. Most people pay attention to the top of the box, but if the box is used the tape holding the base together could be prone to damage/splitting; so re-tape it. When packing more than one instrument, remember to keep a 50 mm (2") gap between the side of the box and the next instrument. 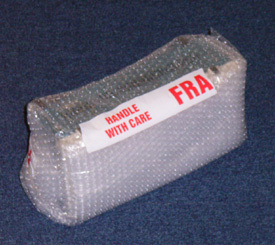 Soft instrument cases are not suitable alone for transport, these instruments should still be packed in a box. 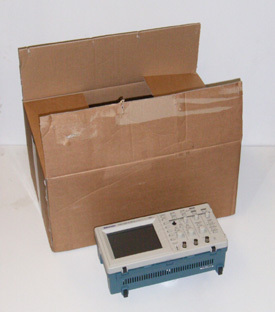 Some instrument cases, usually of the hard poly or metal type, can be sent by carrier without any external packing; but check with the instrument manufacturer. If the case can be used still tape down the catches. 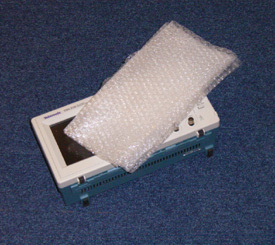 then wrap the instrument in a couple of layers of bubble wrap. If you are sending in cabels, leads or accessories, pack these separately in the box so that they can not cause damage to the instrument. 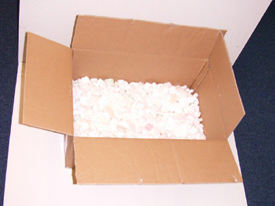 Fill the box with at least 50 mm (2") of poly-chips. For this exercise we have used white, green and pink chips, as all they all complement Tektronix Blue. Fill the box up to the top with poly-chips then, holding the edges, shake the box lightly, this will let the poly-chips settle; then re-fill to the top as required. If you are not using a 'Document Enclosed' wallet, place the Packing Note in now. 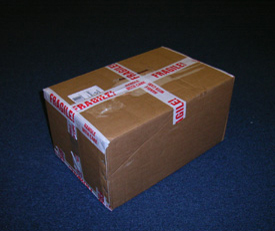 For larger boxes it is easier to put tape from side-to-side first. 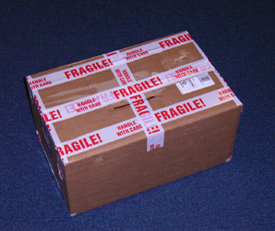 Cross out any previous courier/address markings with marker pen. If using 'Document Enclosed' wallets, affix with the Packing Note; otherwise address using printed labels or write the address on the box with marker pen. If you are not using a 'Document Enclosed' wallet and you now notice your Packing Note sitting minding its own business on your table; take deep breaths and count to ten...carefully open the box and go back to Step 2.